The project shows its results to date and the challenges to be faced in the future. Five solutions have been presented with effective outcomes to the three Living Labs to validate the project achievements into a real business context. Clusters 2.0 consortium members and partners are proud to present the first results towards a more sustainable goods transport system in Europe. The project has reached the midterm and outlined three Living Labs in order to define the business model: Proximity Terminal Network & Cluster Community System, Symbiotic Network of Logistics Clusters and Innovative Cluster Handling Technology. Five solutions have been already developed by the project partners to find the key for the problems found on the Living Labs: CargoStream, Cluster Community System, New Modular Logistics Units, Slot Booking App and Massification project are the first results to tackle these identified business ecosystems. 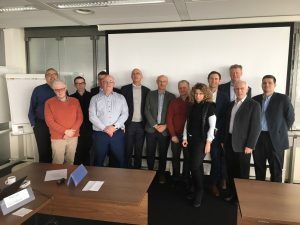 Clusters 2.0 EHLIG (European High-Level Industry Group) first plenary meeting participants in Amsterdam. Project deliverables have been issued and published for public dissemination on Clusters 2.0 website : CNI Description of the minimal data set, CNI API Description, Specification sheet of designated NMLU, Reliable train-truck horizontal transshipment prototype and more deliverables are available. Clusters 2.0 will provide a crucial step towards a more sustainable transport system in Europe. The main project objective is to enhance collaboration of logistics companies and increase freight managed in logistics clusters resulting in an increase in load factors and enhanced use of intermodal transport. Thus, with the implementation of Clusters 2.0 procedures and tools short, mid and long-term effects can be stimulated leading to less CO2 emitted from the transport logistics sector as well as to less congestions on European roads. 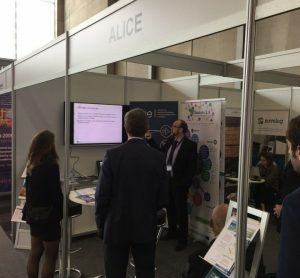 Clusters 2.0 project at the ALICE booth during the Transport Research Arena 2018 (TRA) Conference in Vienna, Austria.